As we move through the "off-season" for Nelson's Sharp-tailed Sparrow in Michigan, I have been thinking more and more about how to hone my search for this species this fall. I had heard through the grapevine a few years back that researchers back in the 1950s did some work in Livingston County on this species, and had quite a bit of success in finding (and even collecting) some specimens. I have finally tracked down this research, and it is very interesting indeed. The paper detailing the work was published in Wilson Bulletin in Sep 1958 (Volume 70, No. 3, pp. 284-286). The authors were scientists at or associates of the University of Michigan, namely Russell Mumford and Dale Zimmerman et al. The article can be accessed in full here. The findings of this article astounded me, especially given the current status of this species in our state (less than annual, and basically considered unfindable except as a rare vagrant). The authors secured *ten* specimens (housed at the Univ. of MI Museum of Zoology) and saw many more individuals of this species during the falls of 1955, 1956, and 1957, all at one location in SW Livingston County. The location is McIntyre Lake; more specifically, the grassy marshes and dry meadows along the margins of McIntyre Lake. This is a place I have never heard of, let alone visited. Nor have I heard of birders going there. 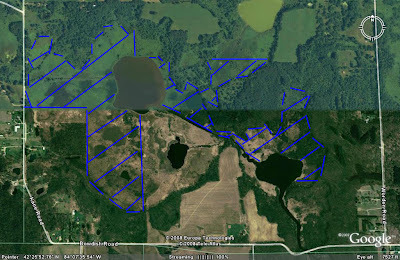 A little research showed that it is located in the Gregory State Game Area in extreme southwest Livingston County, about 0.2 miles north of the Washtenaw County line, and 0.8 miles east of the Ingham County line. Here is the current aerial imagery of the site. 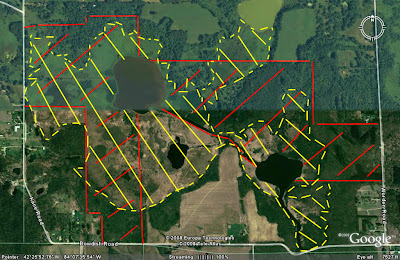 Public ownership (Gregory State Game Area) is here shown in red, with areas of meadow or marsh habitat striped with yellow. 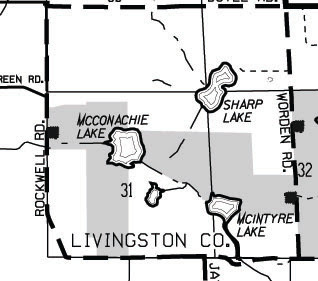 Here is the map I used to adduce ownership, taken from the DNR's website, and purported to be current as of 2002, with gray indicating DNR ownership. Lastly, here a map layering public ownership with proper Nelson's Sparrow habitat. In other words, the areas that can be searched for Nelson's Sparrow are in blue. In order to enter the property without trespassing, you will have to park on Worden Rd on the east border, or on Bowdish halfway between Leeke and Jaycox, or near Kane and Green Rds on the west. Here I'll summarize the main bullet points of this important paper, then wrap up with what this means for my upcoming search in 2008. Your thoughts and comments would be appreciated in the comment line. -Thus, the searchers detected the bird on 4 of 5 visits in 1955 and 2 of 5 visits in 1956. Dates for 1957 are not specified. -Up to four individuals were seen daily. -McIntyre lake has both wet, boggy marsh, and dry upland meadow, and the sparrows used both but *preferred the dry meadow*. -The Sparrows preferred extensive 1-2 ft high vegetation and avoided cattail unless flushed there. -Most of the Nelson's Sparrows observed were easily observed! These results are really extraordinary in that no one since has even observed 2 Nelson's Sparrows at the same location in Michigan! Further, all or nearly all individuals have shown up at vagrant traps as single birds, not at preferred habitats where the birds appear to be lingering. If this species really is as rare as it seems in Michigan, this paper's results deserve explanation. Perhaps the authors experienced a once in a lifetime fluke for three straight years, or perhaps the species has declined in abundance so that it simply doesn't occur in these numbers anymore. Or perhaps birders since haven't entered appropriate microhabitats during Sept 20-Oct 15 with this species in mind, walking through the sedge and watching for Ammodramus to flush. Starting around 9/20/2008 I (and hopefully some of you reading this) will visit this site as often as possible, starting at dawn, and coursing all through the meadows and marshes. I would really like to know whether this species continues to occur there, or whether the habitat has grown up to any degree. Perhaps the species will be as easy to find as it was during 1955-1957. I won't pretend to be certain of the answer, but I know where I'd put my money. Lastly, how does this relate to my search of 2007? First, I am struck by the mentioning that the sparrows preferred 1-2 ft tall dry meadows. Most of my time was spent in 3-5 ft tall wet marshy habitats like Hofma Preserve. This may make the bird, if present, harder to locate. Or it may be less preferable habitat which they avoid. If either supposition were true, then my search image would need honing. I am also struck by their observation that the birds were easily observable once pished up. I didn't spend a lot of time pishing this year, and again I may have been in the wrong habitat types, but I don't often think of this species as easy to observe and was always paying very close attention to anything that flushed. This paper at least gives me hope that our chances are good. I look forward to seeing what fall 2008 may bring. I will also add that there are spring records, including many mentioned in this paper (none from McIntyre, however) as early as late April, but mostly around the last 10 days of May. So it may not be entirely a waste of time to search in this manner during this time period as well.